Located between Cranbrook and Bicheno. Great Swanport operated there as a Post Office as early as 1851. The Office was later referred to as APSLEY or APSLAWN - these being the names of the two properties owned by the Lyne family. A Post Office appears to have operated at Apsley at the Railway Station at least from 1 February 1892 to 1912. It had been previosly gazetted as opening on 1 September 1890. The Telegraph Station was opened at Apslawn on 13 July 1887. J. Lyne was the Station Master in 1900 and he was followed by W. Bowker in 1911-12. Only manuscript cancellations are known on telegram forms from 23 January 1902. The first c.d.s. recorded is for 28 June 1927. See mss date stamp of 19 April 1902 on TC-TO-5C. The most famous resident of Apslawn was Sir William Lyne - a former Premier of New South Wales who was born in Apslawn on 6 April 1844. He was the first person to be called on to form the first Federal Ministry of the Government of Australia - ahead of Mr. Barton. The Telegraph Office was open at Bicheno on 13 July 1887. The office was located on the East Coast line from Richmond to Swansea. 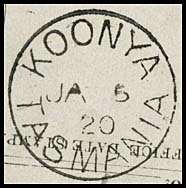 The Post & Telegraph Office was opened as Koonya on 1 September 1897. The previous Post Office was transferred to Port Arthur in October 1853. A new office was then opened and operated as Cascades from 17 December 1884. The office commenced the East Coast line from Richmond to Swansea. The Telegraph Office opened in Sorell in January 1876. The office was located on the East Coast line from Richmond to Swansea. The earliest recorded telegram to Sorell is 6 August 1877 from Hobart. The Telegraph Office was opened in 19 January 1876 when communication from Hobart to Spring Bay was established. Originally called Great Swanport in the 1820s, the name was changed Waterloo Point which was the name when the first Post Office was established. Then, about 1863, the name was changed to Swansea. "Many who once ridiculed the idea of a telegraph between Swansea and the metropolis, now live to appreciate the benefit of rapid communication. Mr A. W. Smith, of the Public School, is to be appointed operator shortly. At present Miss Hallam is performing the duties pertaining to that office. I think Mr Smith's appointment will meet with public approval and, if that gentleman performs the duties of his new office with the same care, punctuality, and courtesy that characterise his management of our Post-office, the public may well have reason to approve of the Government's selection". Listing of Tasmanian Telegraph Offices.